Cortex Command is a 2D side-scrolling action game developed by Data Realms. In the game, the player takes the role of a disembodied brain, who controls various clones and robots to achieve his aims. Missions contain tasks such as retrieving a control chip in a cave filled with zombies to defending the brain from attack. As the brain is weak, the player must manage his resources carefully, protecting the brain, mining gold and fighting off enemies. The game includes the ability for players to create mods (additions and changes to the game) with the built in Lua programming applet, and simple scripting. 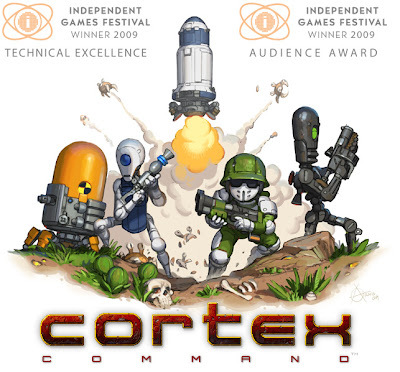 The good news is, Cortex Command is nearing its final release. Windows and Mac versions of the game will be released on Steam by the end of this month and a Linux version will follow soon after (will be available on Steam). If you have Humble Indie Bundle 2, you should receive final updated Linux build when it is released. If you don't have the game, grab it from Humble Store to have instant access to latest development build.